Alligator bluesman who came of age with Freddie King, Magic Sam & Otis Rush died August 12, 1997 at the age of 57, succumbing to inoperable cancer just a month after being diagnosed. Agressive and emotional guitar, but talented, the ex-West Sider had lived for many years (since 1984) in Paris. He won 5 W.C. Handy Awards (the Grammy of the blues world) the previous year, including Contemporary Album, Artist, Song, and Blues Entertainer of the Year. Wow. His 6 Alligator Records releases include Soul Fixin' Man and Blue Streak, and his last -- Reckless. 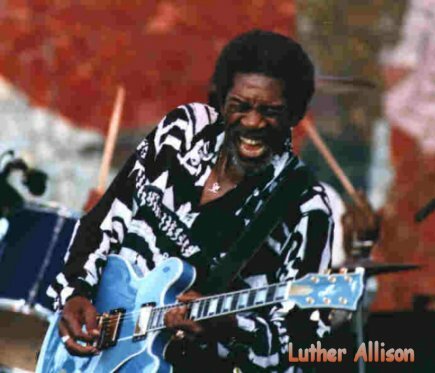 Before his death, Allison contributed to an upcoming Rolling Stones tribute album (House of Blues) that will feature Junior Wells, Taj Mahal, Otis Clay, and the late Johnny Copeland.